Michelle Waters’ political and confrontational paintings are uncompromising in their indictment of our society’s greed and avarice as the source of the environmental crisis. Waters uses sardonic humor to give voice to animals whose world is being destroyed by development, greenhouse gas emissions, chemical usage and over-consumption. 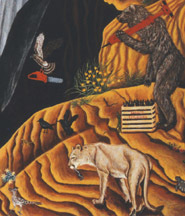 Her anthropomorphized animals include grizzly bears with jackhammers, hawks with chainsaws and a mountain lion with an acetylene torch ready to deconstruct industrial objects such as dams, tractors and other man-made inventions. One painting shows domestic farm animals sitting down to a dinner of Farmer John as the main course with an apple in his mouth. Such images subtly call attention to our concept of the food chain where cows, pigs, chickens are considered beef, pork, poultry - possibly as a way to remove the guilt over eating meat? Waters points out these questions in her environmentally aware images. Laura Parker’s work promotes the farmer as an artist. Her series “Land·Scape” explores several issues currently facing the farm and family farmer. 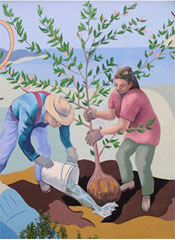 Keeping in touch with her family farm roots, Parker’s unique and provocative artwork explores the notion that an actual fruit or vegetable is as much a work of art as anything else displayed on a museum wall. As part of her provocative installation, Parker also explores the complexities and the art of soil with a pseudo-soil tasting which invites us to explore our connections with our food through our sense of smell and taste. 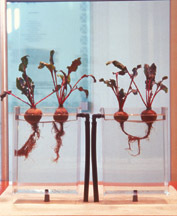 Parker’s installations examine how the face of agriculture has been utterly transformed in past years, the use and misuse of technology, the immense impact of synthetic chemicals, and the impact such chemicals have had on the environment and the health of farm families.